St. Britto’s College took up initiatives to light up the spirits of the students for 70th Independence Day Celebrations. The main motto of Independence Day celebrations was to boost and spread freedom thoughts & national integrity among college students. Competitions were held to ensure participation from the Students and to feel the requisites of Independence Day Celebrations in College. 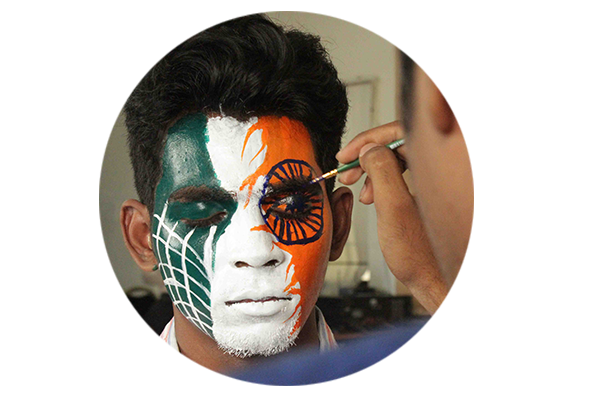 The Theme was sensualized to be “70th Independence Day” and all the competitions were designed with same sensation. The following are the list of competitions held in lieu of Independence Day Celebrations. The Participants depicted their artistic skills with the mentioned theme using vibrant colours. Each team showcased their talents with paint spread on the face. Students had a different vision of the Independence Era and they drew with keen interest and acute involvement. The topics for the essay writing were listed below and this topic choice made the students feel motivated to glance at the Independence Day Celebrations all over India and to meticulously watch the speech of great leaders and politicians which are the vital ingredients for Independence day Celebrations. Wings of Freedom of thought amongst college Students in India on 70th Independence day. Independence Movement by Youngsters in India – Present & Future. Avenues to reciprocate Independence thought among College students in India. Students of All classes took the opportunity to decorate their classes with the mentioned theme and also to showcase the spirits of their unity and integrity for Independence Day. St. Britto’s College has created an avenue for the Students to proclaim the necessity of celebrating Independence Day in the Campus and it is crystal clear that with full dedication and involvement of the students, the day was successfully accomplished to the fullest satisfaction. Jai Hind!